Please note that players who have more than 40 and less than 100 characters after the merger will see their characters by level, in descending order. 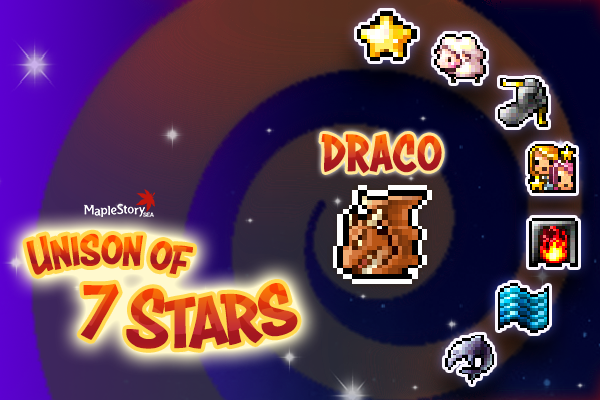 (Up to 47 visible) However, players with more than 100 characters in Draco will have their characters shown at random (Up to 47 visible). Players who only have characters within 1 World before the merger will still see their characters in the same order as before. As we seek to improve the services we provide for you, we will be streamlining the login aspect for our current D2J players. Ever since the merger of Delphinus, Eridanus, Izar, Fornax, Gemini, Hercules and Jynarvis Worlds back in 2016, we have seen the D2J community grow and flourish as much as it did in other worlds. In spite of that, we were unable to accommodate for players who wished to participate in the Burning World events back in v180 if they had more characters in the worlds Eridanus thru Jynarvis. As such, we are going to unite all individual D2J worlds into a single login gateway, such that everyone can play together and experience everything the game has to offer, and to be able to fully participate in future contents akin to Burning World. The login gateways for D2J will be merged, and all current players in D2J will access the game from the newly merged world: Draco in the World Select screen. This merger will occur on 3rd April 2019, during the v185 patch update. Please note that the following will only occur to current D2J players, unless otherwise stated. Residents of Aquila, Bootes, and Cassiopeia will not be affected by this change. To facilitate for the Unison of 7 Stars, there will be several Character Creation restrictions applied across D2J world effective immediately (20th March 2019) until the v185 patch update. •	All accounts created before 19 March 2019 inclusive will no longer be able to create new characters in all Worlds across D2J. Players can still create characters in Aquila, Bootes, and Cassiopeia. •	All new accounts created after 20 March 2019 inclusive will not be able to create characters across E2J (i.e. Eridanus, Izar, Fornax, Gemini, Hercules, Jynarvis). Players can still create characters in Aquila, Bootes, Cassiopeia, and Delphinus. •	All characters within the same Maple ID in Delphinus, Eridanus, Izar, Fornax, Gemini, Hercules, and Jynarvis will be moved to Draco. •	The maximum character slot in Draco will be 47. •	The total amount of character slots available per Maple ID in Draco will be summed up based on the amount of slots available across D2J worlds, up to a total of 47. •	Players who have less than 47 available character slots can obtain the Character Slot Expansion Coupon from the Cash Shop for free. •	Players who have more than 47 character slots available will only be able to use up to 47 character slots. •	D2J players who currently have more than 47 characters combined across D2J worlds will not be able to see all characters in Draco. Only a maximum of 47 total characters is displayed. To see or access other characters, current viewable characters will have to be deleted. •	Players who have more than 47 characters across all D2J worlds as of 20 March 2019 will receive an email from us within the week. Players may opt to request for bulk character deletion by following the instructions in that email by the following Thursday, 28 March 2019, 2359hrs. •	As the email above may be routed to Spam and/or Junk folders, players are advised to keep a look out for the emails if they suspect that they have a lot of characters across D2J. •	Otherwise, players may delete the excess characters themselves with the Delete Character function on the Character Selection Screen. •	Please note that players who have more than 40 and less than 100 characters after the merger will see their characters by level, in descending order. However, players with more than 100 characters in Draco will have their characters shown at random. Players who only have characters within 1 World before the merger will still see their characters in the same order as before. o	Cassandra has 70 characters (less than 100) in Draco after the merger. She will be able to see all characters in her account in descending level order on the character selection screen. o	Phantom has 103 characters (above 100) in Draco after the merger. He will be able to see characters at random, regardless of their level. •	All players are advised to exercise due caution when deleting characters and that all character deletion is final and cannot be reverted in case of any oversight. There will be no reimbursements for any excess items on deleted characters. •	The total amount of storage slots available per Maple ID will be summed up based on the amount of storage slots available across D2J worlds, up to a total of 128. •	The maximum storage slot in Draco is 128, unchanged per world. •	Players who have more than 128 storage slots total by 20 March 2019, 1000hrs, will receive appropriate compensation for any Maple Cash spent on storage expansions. •	Should players have more than 128 items placed in the Storage by v185 patch on 3 April 2019, they will be unable to see additional items until the storage is emptied to have less than 128 items stored in the storage. •	Items will not be deleted, just temporarily hidden from view. •	Players are strongly advised to clear out their storage before 3 April 2019 should they suspect that they have more than 128 items placed in the storage to prevent any complications from occurring. •	The total amount of Mesos in storage will be summed up based on the total amount of mesos stored across D2J worlds, up to a total of 29,999,999,999 mesos. •	The maximum mesos that can be stored in Draco is 29,999,999,999, unchanged per world. •	Players who have more than 29,999,999,999 mesos total by v185 patch on 3 April 2019 in their storage will only be able to see a storage balance of up to 29,999,999,999 mesos. Players will be compensated with the excess mesos in a different form, such as Coins that can be exchanged for mesos. •	Players are strongly advised to clear out the mesos in their storage if there is more than 29,999,999,999 mesos placed in the storage to prevent any unforeseen complications from occurring. •	There is an upper limit to the amount of Cash Items that can be stored in the Cash Shop Inventory. •	Should players exceed the upper limit of cash items in the Cash Shop Inventory within the same faction by v185 patch on 3 April 2019, they will be unable to see additional items until the Cash Shop Inventory is emptied. •	When this occurs, an error message will prompt the player to empty the Cash Shop Inventory to see the remaining Cash Items. •	Cash Items will not be deleted, just temporarily hidden from view. •	Players are strongly advised to clear out their Cash Item Inventory should they suspect that they have a lot of items placed in the storage to prevent any complications from occurring. •	There will be no changes to Union Ranks, Union Coins, and Union Level of D2J Players. •	The Union Blocks and Presets previously set will be reset in Draco. •	There will be no changes to quests that can be done once-per-world in Draco as the system operates the same way as it was in D2J. •	This includes Monster Collection as well. •	There will be no changes to Guilds or Alliances formed in D2J as the system operates the same way as it was in D2J. •	There will be no changes to weekly rankings in Draco as the system operates the same way as it was in D2J. Will this affect my IGN, or any other information pertaining to my character? ➢ This will not be an issue as character names cannot be duplicated. Can I still create a character in D2J? ➢ Character creation will be restricted from 20 March 2019 to 3 April for current players. After the Patch Update on 3 April, you will be able to create a character in Draco if you have an empty character slot. I have less than 47 characters, but they are not showing up! ➢ Please obtain the Character Slot Expansion Coupon from the Cash Shop and expand your available Character Slots to 47 after v185. The coupon can be obtained free-of-charge. My characters were created in Fornax (or any other D2J world). Will I still access them by clicking on the respective worlds? ➢ You can access that character by entering Draco World as of v185. Does this mean that the characters that are previously in a different world within D2J will be added to my Union Level? ➢ Yes. For Example, Brighton transferred a Level 200 Zen during Burning World Leap to Delphinus, but he previously had a Union Level of 5000 in Izar. In Draco, all the characters will now be in the same world, and so Brighton’s Level 200 Zen will be included in the Union Level, bringing it up to 5200 in Draco. ➢ Please note that only the 40 highest levelled characters within the same world will be accounted for in the Union Level, among other Maple Union Restrictions. I can’t seem to find an item that I previously had in Storage. ➢ Please check if your storage has more than 128 items. If so, please remove some items from the storage and check again. I can’t seem to find an item that I previously had in Cash Item Inventory. ➢ Please check if there is any error message prompted upon entering the Cash Shop. If so, please remove some items from your Cash Item Inventory and check again. While clearing my characters, I have accidentally deleted a character unintentionally. Is it possible to revert the deletion? ➢ No. Players should only delete the characters when they are 100% certain that the character and all items located within that character is no longer needed. There will be no reimbursements for any excess items on deleted characters. All character deletion is final and cannot be reverted in case of any oversight. Please be careful when deleting characters.